"Sonic Spinball" redirects here. For the 8-bit version, see Sonic Spinball (8-bit). UK ▼ 2010-12-16 £1.79 ? Sonic the Hedgehog Spinball (Japanese: ソニック・スピンボール) is a pinball game (using Sonic as a ball) combined with the storyline of the Sonic the Hedgehog. 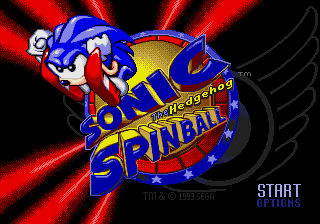 The games title is a pun on pinball and Sonic's famous spin move. It is the only official game to incorporate the characters and setting of SatAM, and one of only two for Adventures of Sonic the Hedgehog (the other being Dr. Robotnik's Mean Bean Machine). The plot revolves around the Veg-O-Fortress, Dr. Robotnik's new mass-roboticization facility built in and around the Mt. Mobius volcano. Sonic must use the fortress' special "Pinball Defense System" to his advantage, working his way up from the bottom of the volcano's interior by stealing the Chaos Emeralds that keep the volcano stable, destroying the doctor's boss guardians and, eventually, taking out the massive roboticizer itself, the Veg-O-Machine. The grand finale is at a launch hangar built around the volcano's crater, as Robotnik attempts to escape Mt. Mobius in a rocketship before it erupts. The game is unique as it was coded entirely in the C programming language when the norm was assembly. Dr. Robotnik has assumed control of Mt. Mobius and turned it into a mechanical base. Utilizing energy produced by the magma flowing under the volcano, this new monstrosity (the Veg-O-Fortress) has the power to transform helpless animals into robot slaves at an astounding rate. Sonic the Hedgehog and Tails fly onto the scene to mount an aerial assault, but Sonic is knocked off the wings of Tails' airplane by a blast from the fortress. He falls into the water, but is rescued and taken to the subterranean levels of the Veg-O-Fortress. The fortress must be destroyed from the inside-out, and the only way to make that happen is to trigger an eruption in the volcano it's built on. Sonic knows this can be done by removing the Chaos Emeralds that keep the volcano stable. Robotnik, however, is also aware of the fragile relationship that exists between the Emeralds and the mountain, and he's set up an elaborate Pinball Defense System to make sure the precious jewels don't go anywhere. Sonic Spinball is basically a continuation of the pinball themed levels first seen in Spring Yard Zone and Casino Night Zone from the first Sonic games. As with those games you have some control of Sonic while he is being knocked around the pinball themed levels. The D-pad will move him while in ball form and the , , and buttons will cause the flippers to flick. If he happens to land on a flat surface you can move in a similar fashion to the Sonic games and be able to jump and perform the Spin Dash. This does not happen often as there are few platforms to land so platforming is kept to a bare minimum. The objective of the game is to collect the Chaos Emeralds which are hidden in each level and defeating the levels boss. To do this obstacles must be cleared and levers must be switched. Rings are scattered around the level but do not grant free lives or extra protection from hits (enemies never attack and you are always in ball form when encountering them anyway). However, if all the rings in the level are collected it will open up the opportunity to visit a hidden multi-ball Bonus Stage known as Cluckers Defense. Unlike traditional Sonic games, you can actually fall outside of the boss arena. The bosses take a lot more hits than normal Sonic bosses, but to compensate it's easy to hit them multiple times in a row. There are two versions that were released in the US, each with differences in music. The European and Japanese versions are based on the final US version but with a few different music arrangements and bug fixes. See the Game Development section/Development for more info. This page was last edited on 17 April 2019, at 01:35.